When asked the why she and many hundreds of other busy, hard-studying students choose to become ‘student leaders’ at UBC, Hannah Barath pauses in thought. As a fourth-year major in Cognitive Sciences at UBC Vancouver, Barath considers the question carefully, then shrugs and smiles. Maybe but when surveyed, student leaders cite the desire to ‘give back and contribute to community’ as the number-one reason to become a student leader on campus. As a globally recognized university with a widely diverse population nearing 60,000 students and 16,000 faculty and staff on both campuses, UBC mirrors the world and as a result, is uniquely positioned, as an educational institution, to help students, and all members of its community, to learn and engage in critical analysis that enables them to identify, address and respond to the systemic nature of oppression. 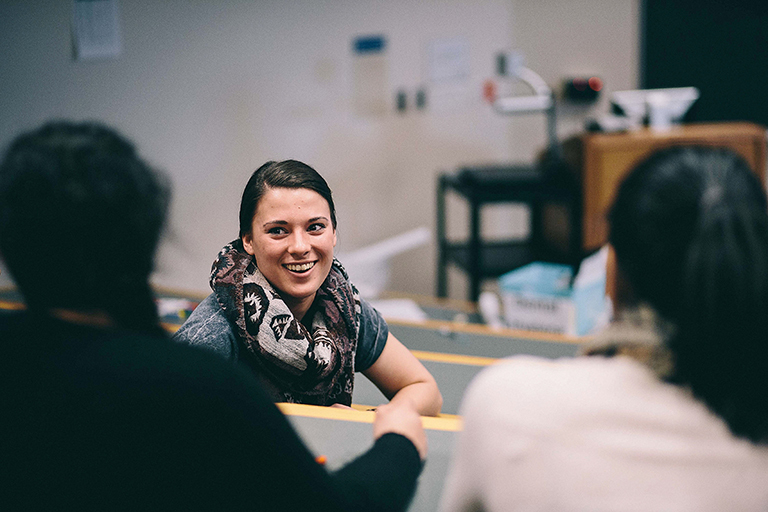 In 2013/14 and in response to the recommendations put forward by the President’s Task Force on Gender-based Violence and Aboriginal Stereotypes, the Vice-President’s Students Office developed and launched an enhanced training program for 1,200 student leaders to build their capacity to foster more respectful and inclusive communities at UBC. The training provided students with proactive tools and methods to help recognize the effects of discrimination, hate, prejudice and stereotyping and develop strategies to address it in the moment. This spring, another 1,500 student leaders have participated in a revised version of this training. Later this summer, an online orientation module will be made available to all incoming students before they arrive on campus and which underlines the importance of respect for place, meaningful connections and individual responsibility in achieving these goals. It’s here where the student leaders shine. For example, each year during UBC’s Imagine Day, more than 1,200 student orientation leaders welcome 7,000 or more first-year students to their first day on campus. For many students, orientation leaders are one of their first peer-to-peer interactions at UBC. The leadership they provide is a critical factor in the success of first-year experience programming. Coordinated through the Vice-President Students’ Office, this peer-support isn’t a one-off; throughout the year student leaders, staff and faculty work together to ensure that every new student feels safe, supported and welcomed. It takes courage to recognize an act of discrimination and respond to it, and even more when the comment or action comes from within one’s own social group. Which isn’t good: silence communicates consent and agreement. Cheesy? No. Quietly courageous, yes. As an educational institution, UBC has a special opportunity to help students, and all members of its community, to learn and engage in critical analysis that enables them to identify, address and respond to the systemic nature of oppression that surrounds us all.